A paved multi-use trail follows the Truckee River downstream from Tahoe City. It is an easy walk and there are many take out locations along the way. The trail officially goes from Tahoe City to Squaw Valley. This 5.6 mile Truckee River trail is mostly flat with numerous small ups-and-downs. It can be done in all at once or just one or more segments: 1.7 miles to Rampart, 1.6 miles to the Alpine Meadows road, and 2.3 to the Squaw Valley road. Crowds of hikers, walkers, skaters, and bikers are here on summer weekends so come early. The River Ranch Lodge is on the trail near its end at Midway Bridge. You can also raft the river along this entire section. You can take the Tahoe Rim Trail north or south from the Truckee River at Tahoe City. Enjoy views of the Truckee River Canyon from either trail along with great views of the lake. You can get information on the “Tahoe City-Brockway Summit” and “Barker Pass-Tahoe City” portions of the Tahoe Rim Trail here. 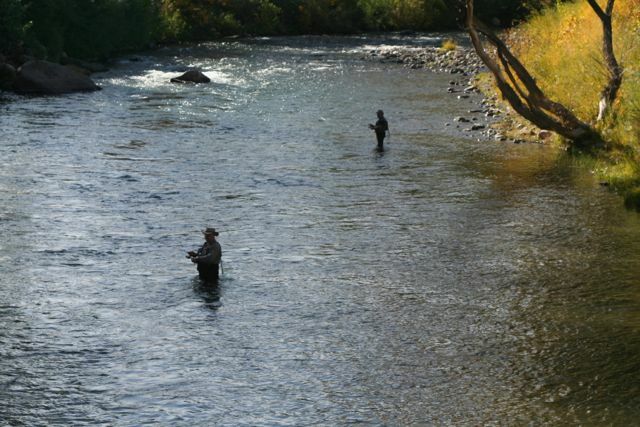 Did you know that there is an “Upper Truckee River”? Yes, indeed. It is the largest stream that flows into Lake Tahoe. Experience the “upper” part of the Upper Truckee River by heading out on the Tahoe Rim Trail “Big Meadows” in the southern Lake Tahoe basin. Here you will walk around the entire Upper Truckee River watershed and its many tributaries and see numerous small Lakes. The “Rim” trail circumnavigates the watershed, but the Hawley Grade Trail takes you to the River in less than 2 miles or using another trailhead you can head to Dardanelles Lake, another source of the river. You can get the basic maps from the Tahoe Rim Trail Association here. Lake Tahoe Area trails: Many trails are found in the Lake Tahoe Basin Management Unit of the US Forest Service (USFS). You can find trails of many skill levels on both the Nevada and California portion of Lake Tahoe. You can get a list of some of them from the U.S. Forest Service. Also, as mentioned before you can also enjoy the Tahoe Rim trail which circumnavigates the entire lake. Get all the Tahoe Rim Trail information here. The Truckee River Legacy Trail heads from near downtown Truckee along the river between two regional parks. However, plans for 2010 include extending the trail significantly downstream. Check the website provided for additional details. Crystal Peak Park has a trail segment which follows the river north from the park for about a quarter mile and there is plenty to enjoy there. of the river which winds its way along the river through the cities of Reno and Sparks. The multi-use, paved trail accommodates both walkers and bicycle riders. The trail is continuous along the river for approximately 10 miles from Ivan Sack Park (just west of Idlewild Park) all the way to where Larkin Circle meets the Union Pacific Railroad Tracks. The Truckee River Trail also connects long segments of river trail through the city streets west of Ivan Sack Park. So, although you have to detour away from the River in a few places, the trail has pleasant miles to roam. West of Ivan Sack Park is Crissie Caughlin Park where you pick up a very nice stretch of trail along the south bank of the river. Further west from the City of Reno’s Crissie Caughlin Park are Washoe County Dorosktar and Mayberry Parks. These two parks are linked by Trails along the north and south sides of the river. The trail segment features three foot bridges and spectacular views of the river winter and summer alike. From Mayberry Park to Verdi there are no hiking trails which follow the river; however, there is a bike route which allows bicycles to travel from Verdi to Mayberry. (See the Tahoe-Pyramid Bikeway website for details.) The trail segment ends heading to the east along the river on the north bank at a turn around just across the river from Washoe County’s Ambrose Park. On the west end of the trail near Mayberry Park the foot bridge leads to the south side of the river where you can pick up the Tom Cooke trail. The Tom Cooke Trail heads up to the Steamboat ditch trail which will take you to the “the hole-in-the-wall” – the tunnel on the Steamboat ditch. swimmers late spring through autumn right in the heart of Reno. The park features 11 drop-pools a total of 2,600 feet in length, or one-half mile. There are five drop pools in the north channel and six in the south channel for kayaking maneuvers. 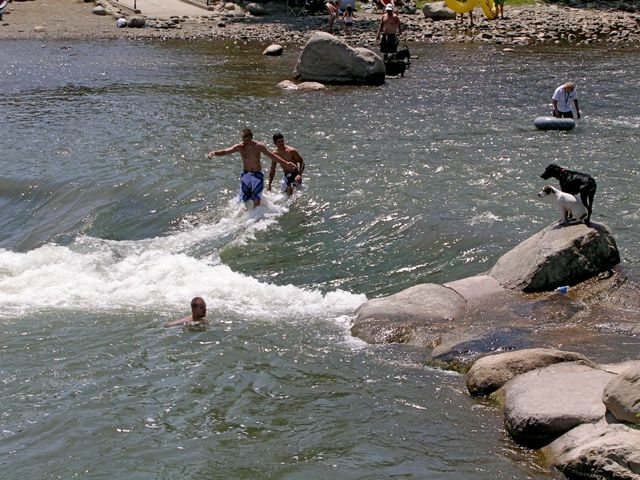 Swimmers and tubers are there every day during the warm summer months riding the current. 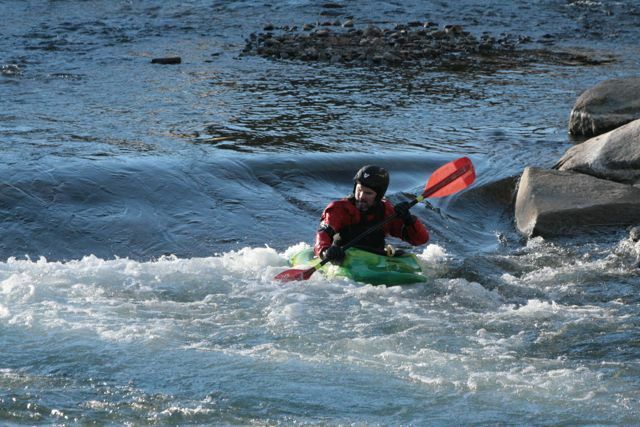 Whitewater Park at Rock Park in Sparks has recently been completed. Rock Park has been a popular place for large picnics along the river for many years. Now, the City has added whitewater features to the river in the formerly agricultural setting. During its first summer open in 2009, it was popular with swimmers and still a favorite picnic spot. Truckee River, Nevada, Verdi to Mayberry Park, class I-III, 8 miles long. Truckee River, Nevada, Mayberry Park to Cottonwood Park, class I-III, 10 miles long. Truckee River, Nevada, Truckee River Whitewater Park Reno, class II-III, 0.5 miles long. Truckee River, Nevada, East Reno/Sparks to Pyramid Lake, class I-II(III), -blank- miles long. The Tahoe-Pyramid Bikeway founder, Janet Phillips, took from an idea expressed by many to a nearly completed reality beginning in 2003. So far the organization has all but 3 segments (as of early 2014) completed. While the Bikeway remains a work in progress, users can enjoy many bike trail miles every day of the year. Find news on the Bikeway’s trails at their website – new open segments, temporary segment closures, and how you can participate in completing the trail. You’ll find Bikeway segment maps at the Tahoe-Pyramid Bikeway website, too. Lower portions of the trail are perfect for fall and spring — even many days in winter. Trail begins at Incline Village Recreation Center.